Our Chamonix Off Piste Skiing Holiday is an action packed week of glacier skiing and technical descents around the Chamonix valley for good off piste skiers looking for a taste of real ‘all mountain’ skiing. From the top of the lift systems we will be using ski mountaineering equipment to access back bowls and big verticals around the range. This is a flexible week, where we travel to other areas if necessary to make the best use of daily conditions. I had a damn enjoyable week, thanks. The conditions were not ideal days one through to three, which was no surprise, and no big deal really as we were guided to some interesting places and made the best of what was available. The last two powder days were a blast and again we benefited from being somewhere very few other people had thought of going. The hotel could not be better in my view, clean, good grub, bar, nice staff, walkable to town. I’ve been going on both Ski & Alpine trips with Alpine Guides since 2007 and keep going back because whatever the weather they always find the best location and conditions available. The Backcountry Chamonix Week in January was no exception, whist many areas such as Les Grande Montets were closed we skied fresh track powder in smaller resorts for most of the week. The pictures say it all! This is a real backcountry ski week. Using uplift and ski touring kit, we access extensive glacier skiing, technical day tours and make frequent visits to nearby resorts in order to catch the best possible snow. This is an intermediate to advanced level trip. To take part you should be at Fitness Level 2 and Tech Level 3-4 depending on the group (see our Fitness/Experience guidelines below). Although some ski touring experience is useful, good skiers can pick these skills up with some coaching at the start of the week. Our base and meeting point is the Hotel de La Couronne in the alpine village of Argentiere, 15 mins from Chamonix. The Couronne is a friendly place in the centre of the village, close to ski hire shops, bars, restaurants and bakeries, and within walking distance of the famous Grand Montets ski area. Rooms are provided on a twin (or occasionally triple or quad) sharing basis, but if you wish to book a single room please let us know and we will confirm availability. Evening meals can be taken in Argentiere in the hotels partner restaurant. Other hotels we may use at busy times include the Chaumiere Mountain Lodge in Chamonix. Hotel details can be found on our Accommodation page. Shakedown day – off piste skiing, typically at the Grands Montets or Tete de la Balme. 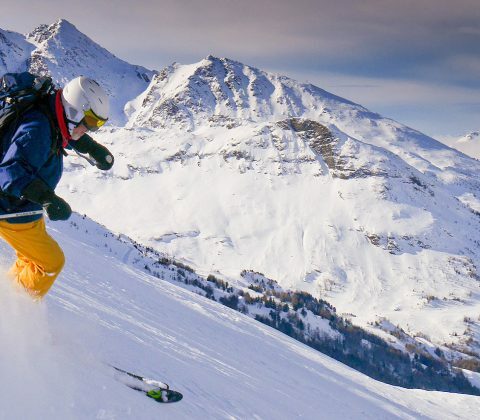 On our first day we enjoy some good quality off piste skiing, mixed with skills refreshement and training – eg in the use of skins, touring kit etc as appropriate. This is likely to involve skinning away from the resort, or heading out onto the glacier for part of the day. The back slope of the Tete de Balme above Le Tour is one of the best tree skiing venues in the Chamonix Valley. Often much quieter than other areas in the valley, there are numerous descents available in north facing terrain through woods and glades, as well as the famous Posettes Couloir. One of our favourite day tours involves skiing down into Switzerland and doing a lovely circuit up through the woods, before skiing back into France at the end of the day. The famous Vallee Blanche run down from the Aiguille du Midi is only the tip of the iceberg in terms of the amazing skiing available in this huge high mountain glacier basin. There are literally dozens of big classic off piste runs including the Envers du Plan, Col du Plan and Italian Vallee Blanche etc – all of which feed onto the lower reaches of the Mer de Glace and follow a common finish – either down to Montenvers and the train back to Cham, or if there is sufficient snow, down to the valley floor via a hike off the glacier and the famous James Bond run back into town. Technical descents such as the Cosmiques Couloir challenge experts and steep skiers and there’s great ski mountaineering such as the traverse of Breche Puiseux and descent of the Mont Mallet glacier. Whatever style and level of backcountry skier you are, there’s always a great day out to be had adventure skiing up at the Midi. 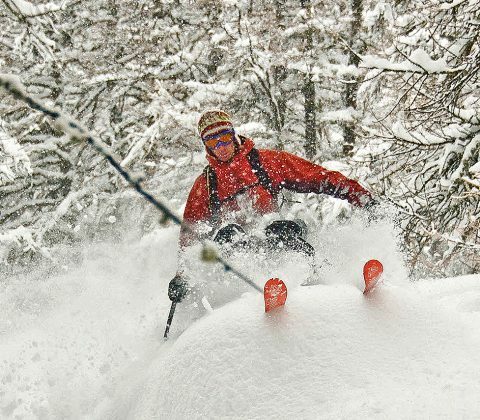 The Grands Montets ski system above Argentiere is famous for having some of the most extensive powder skiing in Europe. Due north facing and with over 2000m of vertical, this is a mecca for off piste skiers and freeriders. From the top of the lift system, numerous descents are possible – either lapping the mountain, or heading off across the glaciers to enjoy a longer backcountry tour. Famous off piste descents include the Pas de Chevre, Glacier du Lognan and Glacier des Rognons. Heading down into the Argentiere Glacier Basin opens up another host of classic day tours – including the Col de Passon, Col des Amethystes and the Three Cols Tour – all of which traverse glacier systems through the surrounding mountains and finishing in great descents back down to the valley – either returning to Argentiere, skiing down to Le Tour, or even down to Trient across in Switzerland. The cols, summits and back bowls above the Flegere lift system in the Aiguilles Rouges offer a fantastic variety of lift assisted day touring and freeriding above the Chamonix Valley. Classics outings such as the Crochues-Berard Traverse, Glacier de Mort and Col Beaugeant cater for different levels of ski mountaineering experience, from first time to expert. Most outings in the Aiguilles Rouges start from the top of the Brevent or Index lifts and involve some skinning to start with and often a bit of boot tracking, to access north facing powder bowls. Many of the routes that lead either back to a ski lift, or down into the Vallon de Berard at the north end of the range and down to Les Houches at the south end. The Vallon de Berard in particular, is a deep, shaded valley that usually holds good snow and finishes with a crazy schuss down through the woods to the bar at Le Buet, before taking a short train ride back to Chamonix to finish the day. The Glacier du Toule is just one of many great venues on the Italian side of the range above Courmayeur. Easily accessible in half an hour through the Mont Blanc Tunnel, the skiing here is every bit as good as off the Aiguille du Midi, but with far fewer people around. Needles to say, the coffee tastes great and the lift stops for an hour at midday – making it obligatory to enjoy a lazy Italian lunch whilst enjoying the stunning scenery! When the snow comes from the south, the tree skiing at Courmayer is also exceptional and well worth making a trip through the tunnel from Chamonix to escape the foehn winds and enjoy some fresh powder! 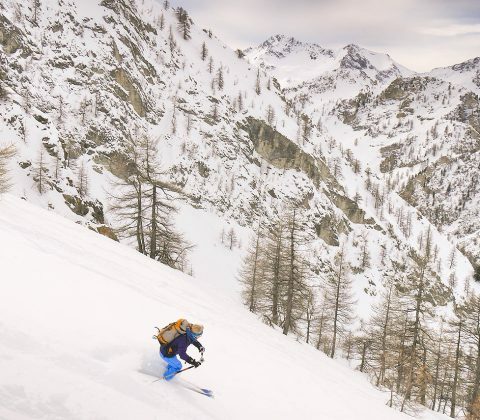 Further down the Aosta Valley, there are several other great freeriding and touring venues such as Pila, that benefit from similar patterns of snow on this side of the range. The Aravis Range an hour south west of Chamonix is another great venue that we visit from time to time. Although these mountains are lower than the Mont Blanc Massif, they always get a lot of snow from the west and frequently hold good powder early season. Good off piste skiing and freeriding is available around La Clusaz, plus a great range of day touring at both lower levels and in higher back bowls depending on snow conditions. Classic outings in include the Tete Pelouse, Trou de la Mouche and Point Balafrasse. During the week we sometimes ski in neighbouring resorts in Italy, France or Switzerland to get the best snow. Return travel should be arranged on Saturday morning, after your final nights accommodation (early departures: if you choose to depart on Friday night, please leave plenty of time for repacking and airport transfer. You will typically be back at the hotel by 4-5pm at the latest, so choose a flight departing after 9-10pm). Your course starts and finishes in the Chamonix valley. The most common way to reach Chamonix is fly to Geneva, then take a shared minibus taxi transfer to the Chamonix valley (must be booked in advance). Airport transfer from Geneva to Chamonix: Mountain Drop-offs offer the best all round service, with regular reliable transfers through the season. They offer a shared minibus taxi service which meets you in the airport and drops you off at the door of your hotel. Book your transfer here and use promo code ALPGUID to receive a discount on your journey.